If you’re fixin’ ta have a Super Bowl party, a Texas theme back at the ranch would impress all of your friends and put you back in the saddle as the best party planner this side of the Rio Grande. I’ve got my Texan going on, so please bear with me. 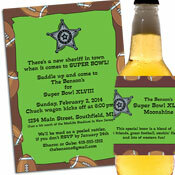 Check out our custom Texas style invitations for super bowl, and have fun with it! It’s not often we can theme Super Bowl and get away with it this easily! Chuck wagon kicks off at 6 p.m.
Now, y’all, Super Bowl decorations, that’s a whole nother' thing. Everything’s got to be BIG. Texas big. Have you seen foam cowboy hats? Now, we’re talking. They make for great décor and great photo ops. Round up some balloons into boquets you can put over yonder wherever that may be. An inflatable cactus on either side of the TV screams Texas, and if you’re feeling more creative than a gnat in a hail storm, you could make some of them WANTED posters using photos of your guests to use as decorations, too. Or if you’d rather use football players, that’s fine too. Now that’s a menu that will make your guests happy as a gopher in soft dirt. Grab some Super Bowl 53 party supplies or some Western theme paper goods, for easy clean up! Think you can decorate the Lone Star Buffet with a few yellow roses and be done? Dag nab it, no! You’ll need a few cowboy hats, at least one steer head (plastic, but still) and a spur or two to finish it off. Plus, use bandanas as napkins ‘cause that’s what they do down there in the lone star state. You might want to put out some Texas T in a punch bowl—1/4 bottle of tequila and a ½ gallon of sweet tea—but do it after all bets are in for the sake of your friends. A Texas Hold’em Halftime would be too easy, but I’m all for it—open the saloon and let them in. Of course, a game of horseshoes may also be in order since trying to figure out who shot J.R. is old news. Or how about pin the tail on the coyote? Give out some inexpensive cowboy hats, bandanas and a few sheriff badges to send all your guests home in style! Set up the items near the door when they come in, so that everyone will be in the western spirit. Also check out Party411's personalized Texas style candy bar wrappers, or customized Super Bowl 53 lollipops to give your guests a sweet sendoff! In closing, this ol’ Texas proverb says it all, “If you're ridin' ahead of the herd, take a look back every now then to make sure it's still there with you” (in other words, make sure everyone is having a great time at your Super Bowl party before you bask in the sunset with a glass of tequila-laced Texas lemonade)!